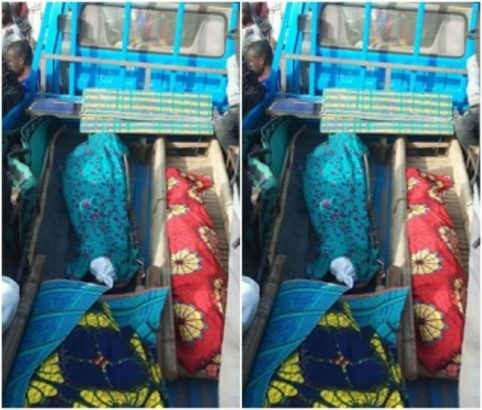 A house fire which engulfed a home in Madaki Street, Bukuru metropolis of Jos-South Local Government Area in Plateau State on Saturday claimed the lives of 35-year-old Adam, his wife Maryam and their three kids; Abdul, Ibrahim and Fatima. It was gathered that the only surviving member of the family, after the fire incident that started around 3:30am from the poorly constructed wooden kitchen of their one-bedroom apartment, was the couple’s daughter Amina, said to be living with her grandparents. 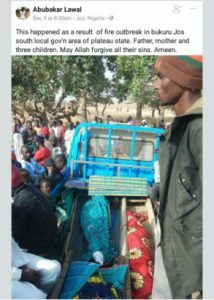 The late Couple’s neighbour, Yusuf Abubakar, who told newsmen that they were able to put out the fire around 4am, said the family had already been consumed then. The State’s Police PRO, ASP Tyopev Terna, who confirmed the incident, said the victims of the fire incident had been buried according to Islamic rites.